I keep trying to figure out how to describe this trip to the people I am going home to and I am at a loss. How does one convey the depth and breath of emotion and experiences that being in Haiti with these children, their caretakers and the amazing people I am so blessed to say I am on this team with. Today is day 5. 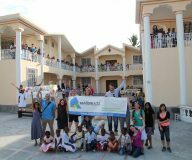 We went back to the ACFFC to help them paint the newer building they are in. Painting with those children was yet another magical experience to add to the already mile long list. 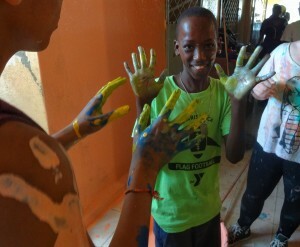 it resulted in laughter,smiles and about 25% of the paint ending up not on the walls but on them and us! By the time we left for the day the rooms and halls were on their way to being bright and happy as the faces that occupy that space. In the afternoon we loaded up the vans and headed out with a group of the kids to tour all the mosaic tile walls that they have created all around the streets of Jacmel. 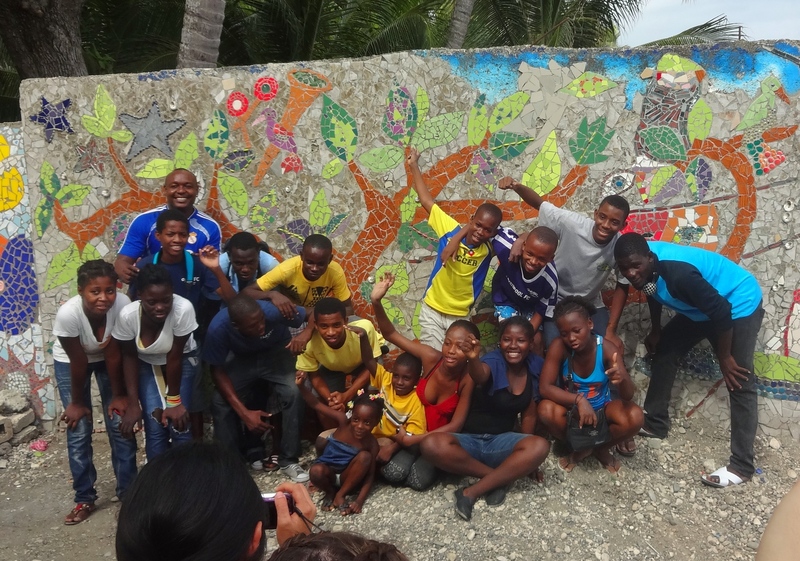 Jorge from the ACFFC told us a story about of the murals that depicts a giant tree. He told us that the tree is Haiti itself. The leaves are its people and the eyes on the wall are those of the world looking out for Haiti. He said they want everyone to know that Haiti will not die! The people that are running the ACFFC are some of the most inspirational and generous people I have ever had the honor to met. They give greater meaning to the word dedication. Their passion for those children is a part of them and you can see it in their eyes and hear it in their words. You can see it in their interactions with each individual child. 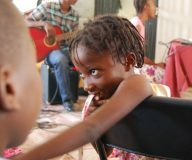 They are committed to assuring that these children will have opportunity. This trip so far has exceeded every one of my expectations. I never imagined that I could be so sweaty, so dirty, so tired and yet so unimaginably happy. But that is what Haiti does to you. in the midst of struggle and sadness there is a powerful joy and hope. Like so many others on the trip have said, I am already changed by Haiti and this place and these children will forever have a piece of my heart.